Cricket owners, be on the lookout for another cheap Android by the soon-to-be-national (but still considered regional) carrier. They’re bringing a device called the ZTE Score that doesn’t do much to move us. We’re looking at a 3.5 inch display, a 600MHz processor, Android 2.3 with their custom UI, a 3.2 megapixel camera and Muve Music support. Couldn’t expect much more for $130 (off-contract price). If you need an android at this price point, take a chance come Sunday. Read on for full press details. SAN DIEGO, Sept. 22, 2011 /PRNewswire/ -- Cricket Communications, Inc., a leading provider of innovative and value-driven wireless services and a wholly-owned subsidiary of Leap Wireless International, Inc. (NASDAQ: LEAP) and ZTE, a leading global provider of telecommunications equipment and network solutions, today announced the launch of the ZTE Score™, the seventh smartphone to be included in Crickets dynamic line of phone offerings and the first ZTE smartphone to be launched by Cricket. Cricket is the first carrier to launch the ZTE Score, which will be available beginning Sunday, September 25 in Best Buy and Best Buy Mobile locations across the United States and will soon be available through Cricket stores and dealers. The ZTE Score is a full-featured Android smartphone providing speed and ease of use, making it particularly appealing for those customers looking to upgrade to a device with todays newest technologies. The phone is based on Android 2.3 (Gingerbread) comes with 600 MHz of processing speed and features a 3.5″ HVGA capacitive touch display, accelerometer and virtual qwerty keypad, 3.2MP camera/camcorder, WiFi capable, 3G real web browsing and XT9 Trace for easy text entry. 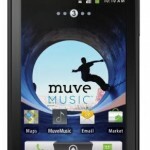 The ZTE Score also includes the new and innovative Muve Music service, and it also offers access to more than 200,000 apps on the Android market, Google Maps and Navigator, Email, MyAccount, Cricket411, and much more. The smartphone will be available for $129.99 (MSRP). 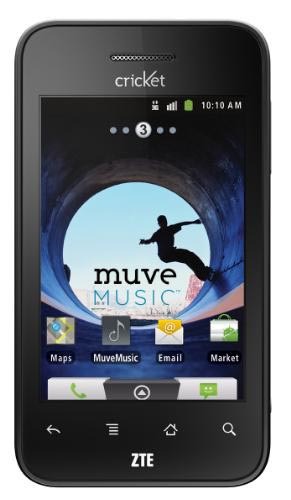 With the Muve Music smartphone plan, Cricket Wireless customers will enjoy unlimited song downloads, ringtones, and ringback tones, as well as unlimited text, picture, and video messaging, 3G mobile data, mobile video, data back-up, and 411 assistance. Muve Music is the first unlimited music service to be included as part of a wireless rate plan and now has more than 200,000 customers. By applying its philosophy of unlimited services and value innovation, Cricket and Muve Music have given their customers a new music experience that ranks high in customer satisfaction. "ZTE is pleased to work with Cricket to provide its customers with new devices that provide the best of todays technology at an accessible price point," said Lixin Cheng, CEO, ZTE USA and President, North America Region, ZTE. "The ZTE Score, powered by Android and an ideal platform for Muve Music, is a prime example of a feature-rich, affordable smartphone that will help consumers enhance their mobile lifestyle." Cricket is the pioneer of simple and affordable unlimited wireless services with no long-term commitments or credit checks required serving approximately 5.7 million customers. Cricket products are available nationwide. Cricket offers wireless voice and broadband Internet services over the latest technology, high-quality, all-digital 3G CDMA2000 1X and 1xEV-DO wireless network. Crickets nationwide wireless voice service plans include unlimited anytime minutes, unlimited U.S. long distance, unlimited text and picture messaging, unlimited text to Mexico, unlimited Mobile Web, unlimited directory assistance, as well as a variety of calling features and feature-rich mobile applications such as popular games, ringtones and wallpapers. For more information on Cricket, visit www.mycricket.com. Cricket is offered by Leap Wireless International, Inc., headquartered in San Diego, Calif. For more information on Leap, visit www.leapwireless.com. ZTE USA is a subsidiary of ZTE Corporation (H share stock code: 0763.HK / A share stock code: 000063.SZ), a leading global provider of telecommunications equipment and network solutions. ZTE USA is dedicated to making quality communications technology accessible to all. The company draws on 25 years of experience and research investment to deliver smart, affordable, quality choices for infrastructure and mobile data device customers nationwide. For more information, visit www.zteusa.com. ZTE is a publicly-listed global provider of telecommunications equipment and network solutions with the most comprehensive product range covering virtually every sector of the wireline, wireless, service and terminals markets. The company delivers innovative, custom-made products and services to over 500 operators in more than 140 countries, helping them to meet the changing needs of their customers while achieving continued revenue growth. ZTEs 2010 revenue led the industry with a 21% increase to USD10.609 billion. ZTE commits 10 percent of its revenue to research and development and takes a leading role in a wide range of international bodies developing emerging telecoms standards. A company with sound corporate social responsibility (CSR) initiatives, ZTE is a member of the UN Global Compact. ZTE is Chinas only listed telecom manufacturer, publicly traded on both the Hong Kong and Shenzhen Stock Exchanges (H share stock code: 0763.HK / A share stock code: 000063.SZ). For more information, please visit www.zte.com.cn. 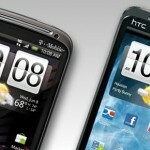 Are Your HTC Sensation and EVO 3D Watching You? Privacy concerns have been a hot topic as of late. Whether it’s Google, Apple or Verizon, consumers and our government is cracking down on what kind of information our smartphones are sharing without our consent. Now, it’s time to turn our attention to HTC who may have added a little something “extra” with the latest Gingerbread OTA that was recently rolled out to the Sensation and Evo 3D. Before you get up in arms over this invasion of privacy, according to HTC, you agreed to this. Simply jump into your device Settings > About Phone > Legal > HTC Legal. If you’re the paranoid type (or simply value your privacy) TrevE and Team Synergy have successfully managed to remove the app and code from the framework and provided a ROMs sans spyware. Unfortunately, ROM flashing and the removing of system apps is only for rooted users. What do you guys think of this? No big deal or (Ricky Ricardo voice) does HTC have some ‘splaining to do? After TabCo’s unveiling as the JooJoo/Grid 10 tablet, we’re not left with much hope for a newcomer in the tablet segment this year… unless you count a few tiny companies that could get decent sales locally. I’m talking about the AndyPad slates, the British tablets will soon be launched locally. AndyPad is aiming at the low budget public, with a 7 inch device that gets both a pro and standard model, to suit anyone’s need. Also, we’re closer to launch than you think, since the cheap tablets will debut on September 1st. Below you can watch a demo of the tablet being played with in prototype phase, in case you’re curios. The AndyPad Pro model is the focus here, with a 7 inch 1024 x 600 pixel display, Android 2.3 Gingerbread, a 1.2GHz Cortex A8 processor and 512MB of RAM. There’s also 16GB of internal storage on board, dual cameras, WiFi, Bluetooth and 1080p HDMI output. No info about the support for Android Market from this device. As far as price goes, there’s a 129 quid tag attached to this unit, if you’re interested. We’ve tested ASUS Eee Pad Transformer right here, as best we could, but we didn’t dare to harm it in any way… However, the guys of AsusRog.com are not that shy, so they scratched the display on the slate, using nails, a knife, coins and finally a bow and arrow. See how the Gorilla Glass took the tests in the vid below! Remember ViewSonic? This is one of those brands behind pretty appealing tablets, just like Archos for example… The reason they’re in the news this time is their new device, the ViewPad 10 pro, a dual OS device with a 1.5GHz processor. Only hours ago ViewSonic revealed the 10pro model, offering both Windows and Android in the same 10.1 inch package. This model relies on an Atom Z670 processor, the 1.5GHz unit we mentioned, made by Intel and with an impressive power consumption, that grants the slate 8 hours with a single charge. The ViewPad 10pro will come with Windows 7 Professional and Android 2.3, plus 32GB SSD, with a price of $699. Windows 7 Home Premium, Android 2.3 and a 16GB SSD will bring the price down to $599 and the device is expected in shops later this month. Other things worth mentioning are the ability to play full HD 1080p video, a resolution of 1024 x 600 pixels and 2GB of integrated memory. It’s nice to be a member of Tablet-News.com these days, since we’re one of the few sites in the world to have received an ASUS Eee Pad Slider unit to play with. Courtesy of ASUS Romania, we can have fun with the device seen here and its nifty sliding keyboard. The whole sliding part reminds me of a bigger Nokia E7 to be honest, not that this is a bad thing. What I noticed from the start is the fact that the box of the tablet is GIGANTIC and the tablet is big as well and rather thick and heavy. My hand hurt even during the 2 minutes of the unboxing, as the device weighs a bit too much for my liking. A few days ago we posted an article talking about the horribly invasive ads popping up on our Android devices thanks to some apps in the Market using an ad system dubbed Airpush. It was probably the worst marketing idea we’ve since the beginning of this Android thing and it was unanimous that nobody wanted it on their devices, and we wouldn’t use apps that displayed those ads. Today, we have a new type of ad system. I know what you’re thinking “KILL IT WITH FIRE!” but would you believe that there is an app on the Market that actually PAYS YOU to view ads on your phone? Now that I have your attention, Tooyoou is an app in the Market that allows you to place a small banner ad on your homescreen in the form of a widget and you get paid through your Paypal account for as long as the widget stays there. Essentially, the company is giving you a percentage of the ad-revenue they’re making off these ads and you don’t have to do anything but give up some precious screen real estate. Easy right? If you guys have learned one thing about me by now it’s that I like to save my monies. So think about it. Even if you’re only making somewhere around $4-5 a month on these ads (a very optimistic estimate), anyone with good financial sense would tell you to save that money and by the time your contract is up, you can a little sting out of upgrading to that new device. This app is very new and there are a few things I’m wary on. For one, Tooyoou requires a lot of permissions which always makes me a bit paranoid. Second, the app requires a constant data connection which has me wondering how this could potentially affect my battery life. I’ll have to give it a spin for a few days and keep a close eye on it. But what do you guys think? Excited to start making money off of your vacant homescreens? Or is the cost of yet another ad on your Android device enough to drive you mad? 1. Multiple widgets do not affect earnings. 2. At any time user can go to Settings -> About Phone -> Battery -> Battery Use and check if Tooyoou uses substantial battery. Tooyoou is tested on multiple android devices and you will never see Tooyoou drain much battery or even show up in the delivered Android battery drain console. 3. Payments go out automatically on the payment date through automated MassPay on our servers connected to Paypal. Users need not do anything at all. 4. Tooyoou Android App users will not be able to log in to the tooyoou.com website with their app username and password. Website is for advertisers only and we have not released user features yet. 5. How is payment calculated? We pay a substantial portion of the CPMs to users now. Clicking the Ad multiple times will not earn them anything. We are optimizing the algorithm so that better user behavior and more interaction with the App benefits them more. 6. We wanted users to have a say/choice in mobile advertising. Coupled with their location you can imagine how valuable this space would be to advertisers going forward. We will be updating the App with more categories very soon. 7. I have replied to most user questions until now and will continue to give my best effort in supporting them. 8. Typical users have made about $2.50 a month. According to comScore, of the 78.5 million people who own smartphones in the United States, 40.1 percent have gone with Android as the platform of choice. The report comes just days after Canalys delivered the results of their own quarterly analytics, concluding that Android now holds nearly 50 percent of the global smartphone market. Android grew over 5 percent from March’s figure of 34.7 percent. Apple, in second place, also showed growth with a 26.6 percent total share, a 1.1 percent gain. All other platforms showed losses from comScore’s previous report. Android handset manufacturers hold the top three spots for mobile handset makers, with Samsung leading the pack. LG and Motorola trail not far behind, with Apple and RIM bringing up the rear. If you’re not ready for Honeycomb yet, than the perfect solution would be buying an Android slate with top notch specs, but a more dated version of the OS. For example, you could have a look at Pandigital’s trio of sub $190 tablets: Planet, Nova and Star. These are 7 inch models, with ARM Cortex A9 processors and rear cameras. The Star model also comes with a front cam, so there’s hope for video calling here, while other feats include HDMI output and the Barnes & Noble app on board. As far as the OS options go, Pandigital Planet and Star receive Froyo, while Gingerbread finds its way on the Nova. Sadly, there’s no trace of Android Market here, but at least you have the GetJar store, plus the U-Player YouTube viewer. WiFi-only as far as connectivity is concerned, so no 3G for such a low price. Memory is a mere 2GB on the Planet and Star, while on the Nova it’s double that amount. HDMI output is done with a separate cable, specialized for this feature. And now the pricing: $189 for the Planet, the same price for the Nova and finally the Star will come later on in August for $159. Expect a flagship Pandigital tablet in September, maybe with Honeycomb. If you’re looking for the perfect tablet, look no further than the ASUS Eee Pad Transformer, that’s pictured and detailed below. This Android 3.1 model already received the Honeycomb 3.2 update last week and it’s also a record breaker, having sold 400k units a month lately. It will promote Honeycomb to new heights thanks to its sales and we finally have a good iPad rival on our hands. The device comes with a 10.1 inch 1280 x 800 pixel display (LED IPS LCD), it measures 13mm in thickness and weighs 680 grams. It’s got stereo speakers and a hugely appealing attachable keyboard accessory, that turns the tablet into a netbook. And what a netbook that is! I tried out an Eee PC model a while back and the Transformer would win a duel with that unit hands down. It’s got well spaced keys, comfortable to use touchpad (that you won’t need, since you’re using a touchscreen) and all the goodness of a portable PC. It even gets two USB ports thanks to the keyboard and an SD card slot, that’s activated for media use by the Honeycomb 3.2 update. Another stunning feat is the battery life, that reaches 15 hours for the tablet and keyboard combined, since the later comes with its own power source. Back to the specs, on the ASUS Eee Pad Transformer we get all the speed and power of the Nvidia TEgra 2 dual core 1GHz CPU, accompanied by 16/32GB of storage, 1GB of RAM and a microSD card slot. No 3G version is available just yet, so we’ll have to do with WiFi and Bluetooth. As far as the camera goes, don’t expect HD video capture and brilliant shots soon, since you only have a 5MP sensor available here, with autofocus, geotagging and a fellow camera upfront, with 1.2MP resolution and videocall usage. This is certainly a great tablet, that’s even cheaper than the iPad 2 in its standalone version. The keyboard is sturdy and resilient, but it tends to creak a bit at times, as does the tablet in the large bezel areas it has. There’s a locking button on the superior side of the keyboard, making it very, very easy to attach and detach the tablet in mere seconds. I really can’t imagine a better replacement for a laptop than this device and with the Eee Pad Transformer 2 already confirmed by ASUS and coming with a Tegra 3 CPU, Apple has serious reasons to be afraid.